Install Android on PC, get your own Android PC! As you may know or even guess, the official Android emulator comes from the hands of no other than Google itself. Installing this emulator will allow you to run one or more instances of Android on PC, each one inside a window, in an isolated stand alone virtual Android machine. The installation and configuration process is rather cumbersome, requiring lots of steps and hard disk space. 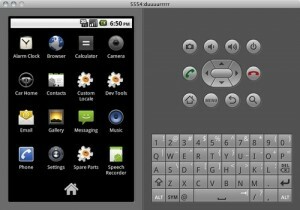 This Android Emulator is mainly used by Android deveolopers, in order to test their Apps on their development computer, because it comes integrated with the Android SDK (Software Development Kit) including readily available debugging and customizing options, much needed by them to test each App into different Android operative systems and environments. Caution: As you can infer by now, this Android Emulator installation and configuration requires a bit of expertise. As a prerequisite, you need to download and install the Java SDK language, from Oracle. Then you need to download the Android SDK installer, which can be found in here. You can download different versions of the Android SDK, including the Android Emulator, each one for different PC environments: Windows, Mac OS and Linux. Once downloaded, you execute the SDK installation. After installing the SDK, you launch the “SDK Manager” (sdkmanager.exe) which will bring up front a configuration screen allowing you to download and install some needed packages (the different Android OS that later you will be able to run into your Android emulator). Right at the manager startup, a popup will appear where you just press the “INSTALL” option, as the needed basic packages are already preselected. Once everything is installed (it may take a lot of time -even hours- depending on your Internet connextion) you are ready to create and configure one or more Android Emulator machines on your PC. From the SDK Manager you select from the top menu TOOLS, the option “Manage AVDs”. A new window will popup with the currently created Android Emulator machines, if you have, and at the right you have the option of creating a new Android Emulator machine. When you press NEW, to create a new Android emulator, another window will popup asking you first to name the Android Emulator. As an example, we will type “My Android Emulator”. Then you need to select which Android OS will be preinstalled on it, from the Target drop-down list. Scroll down to the bottom and select the newest Android available. In our example, we will select Android 4.0.3. Now you need to create a virtual SD memory card where the android previously selected will reside. Just make it big enough for it to work. In our case we will write 512 on the SD Card Size parameter, and leave it at “Mb”. You need to select a virtual screen resolution. For example, we will leave it at the default selection which is WVGA800. Everything is set! Now you just press the Create AVD button on the low-right side of this window, and the Android SDK will churn out into the Android Emulator list of yours, your recent creation. Once there, you select it and press START to get it running. It may take some minutes to start up, but you will end with a virtual Android Emulator running inside a window in your PC. i’ve done everything before second step, but I don’t have any options when I need to select which Android OS will be preinstalled on it, from the Target drop-down list. I don’t have Target drop-down list, how is that posible? I have done everything as described above and the android shows it is loading in the mini windows and after 10 minutes it is still showing android on the screen but dont go further. Pritam, Android emulator is a bit on the slow side, but not THAT slow ! please try creating other virtual machines, maybe with different memory size assigning and different screen resolutions ? Or maybe you are trying on an old PC ? (like 256mb ram and celeron 900mhz processor ?) It is odd that it is not managing to actually boot your emulated Android machine. I have tried to make the android emulator and every time it fails saying failed to parse properties??? I am trying to create a new AVD but its not letting me choose the operating system. What is it that I might be missing? well yes it actually worked and created a virtual android, what i really want to know if its possible to run android games via this method, if theres a post about this “idea” that i know im not the only one trying to do this can you plz reply me the link or answer my doubt? The Android emulator from Google is just too slow to be useful for games… we recommend you try bluestacks emulator. Hmmm I would try with other games / apps. I tried downloading some games on my LG Optimus 3D, and surely at least one of them did close automatically. You don’t need an emulator, to find a poorly designed / mismateched Android version game or app that crashes on you. hi!!! the problem is ..that i am not getting an option for creating an AVD rather it is saying at that place (ok) and also this option doesn’t work …any help …?????? Can i run “whatsapp” in pc by using this enumulator? How can you make the android installation look like a mobile device for application compatibility purposes? I’ve found some apps that won’t run with the error that it’s designed for a mobile and table device. Bluetooth Mini Keyboard Are you looking for a bluetooth mini keyboard for your Android device ? Reset Android Detailed instructions on performing a hard reset Android on your PC, tablet or phone into factory settings. This blog has no relation with Google. Android is a Trademark of Google Inc.